Mike the Knight on the CBeebies channel was an instant hit with younger children when it was launched at the end of 2011. Character Options quickly snapped up the licence to make the toys, one of which is the fantastic Mike the Knight Deluxe Pendragon Castle. This double-tiered playset features Mike’s bedroom on the top floor of the turret, and a concealed slide leading to the ground floor stable. From here, Mike can quickly mount Galahad, his trusty horse and friend, and gallop off to more adventures. Children can also have fun looking for the hidden trophies and treasures, as well as arranging the mirrors and hay feeders in the stable. Mike and Galahad figures are included in the set. Other Mike the Knight playsets worth looking out for are an Arena where the jousting competitions take place, Hairy Harry’s Horse Stop, and a special Viking Ship with an exclusive rowing action. 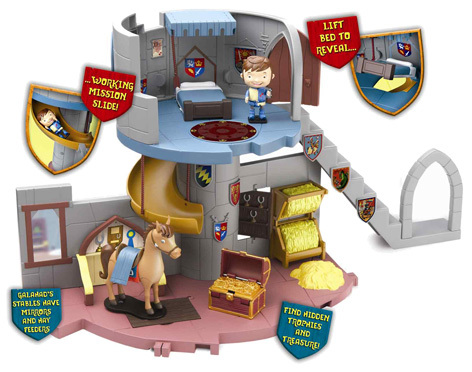 Mike the Knight Deluxe Pendragon Castle Playset is a wonderful toy for all fans of the show. Combined with the other playsets, kids can have hours of fun with their friends re-creating their favourite scenes from the cartoon series. Please tell us what you think of the Deluxe Pendragon Castle Playset by Character Options.